Buildings are responsible for approximately 40% of energy consumption and 36% of CO2 emissions in the EU. An estimated 97% of the current EU building would need to be upgraded to achieve high efficiency standards. However, a number of challenges, from eco-gentrification to funding application capacity, have limited the opportunity for energy efficiency retrofits in social housing. As part of the Social Green project, Nordregio studied the complex issue of how achieve retrofits without create new social burdens. A series of barriers were identified, including a lack of knowledge to access available funding; strict stipulations on how to use of public funds for social housing retrofits; limited benefits to social housing residents themselves; incomplete data to measure what matters; and a lack of focus on rural and sparsely populated regions. Solutions to these challenges were subsequently identified through engagement with Social Green partner regions, local stakeholder groups and good practices. The solutions underline the importance of European level policy improvement on one hand, and a place-based perspective in policy design on the other. It is vital to identify buildings as critical infrastructure, with designated thematic objectives and earmarked funds within all operational programmes. Combined with more flexible financing solutions and consistent monitoring, these improvements can respond to the practical challenges faced by the decentralised network of local actors while ensuring benefits for residents in both urban and sparsely populated regions. Ultimately, these actors are responsible for seeing out the transition towards a truly energy- and resource-efficient European housing stock. Addressing the challenges they face is central to a greener future in Europe. 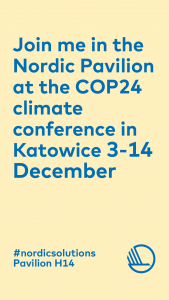 Nordregio will participate with two events at the UN climate talks (COP24), one on energy efficiency in the building sector and one on the biobased society. Join the discussion in Katowice and on social media!